In October 2010 Dr. Tom Newland became one of the first veterinarians in the Phoenix area to be trained by Dr. Mike Hutchinson with Medi-Vet Labratories on a new technique involving In-House Stem Cell Therapy. Shortly after, both Dr. Newland and Theo Pyres, CVT, became certified to perform the procedure. In-House Stem Cell Regenerative Therapy uses ground-breaking technology to harvest adipose stem cells from the fat tissue of animals. After these cells have been extracted and activated they are injected into the arthritic joints of the animal. This is all performed while your pet is under light anesthesia. The technology created by Medi-Vet Labratories allows for the entire procedure to be completed in the hospital and all in one day. Other technologies take several days for the cells to be harvested, activated, and then injected, which also requires the animal to be under anesthesia multiple times on different days. 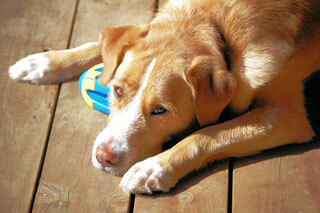 We are now offering in-house regenerative stem cell therapy for osteoarthritis in both dogs and cats. This is a drug free treatment that is performed in-house on a same-day basis. The procedure is proven to relieve pain and increase range of motion. In many cases we can see treated animals walking, running and jumping as little as three weeks after the procedure. Stem cell regenerative therapy involves removing fat tissue from your pet, separating and extracting the stem cells from the fat, activating them and then injecting the stem cells into the affected joints. Your pet will go home the same day! Please call us with any questions you have or if you would like to schedule a consultation with Dr. Newland or Dr. Davis.